MineSmith Australasia is a mine optimisation consulting service specializing in mine planning and mineral project reviews, with a focus on mine optimisation, strategic analysis and the evaluation of risk. MineSmith Australasia provides a full range of mineral project optimization services to our clients. MineSmith Australasia’s principals have completed assignments for major mining companies in Australia, Africa, PNG, SE Asia and the Americas. MineSmith Australasia maintains a policy of independence from exploration and mining interests and complete confidentiality of client information. In addition to or core services, we collaborate with other independent consultants providing a broad-based mine planning service including underground and production simulation. Projects have ranged from small mines needing highly detailed mine plans to strategic planning of very large and long-lived mining and processing complexes. Our specialty is the integration of strategic issues, such as reserves, cut-offs and capacities with the operational complexities of active mining operations. No client is too small. No problem is too complex. The core of mine planning is an optimal production schedule. MineSmith Australasia takes scheduling to a new level with the Life of Business Optimisation System (LOBOS™). LOBOS integrates the optimisation of mine design, scheduling and financial modelling by incorporating the financial model directly into the optimisation process. Resource models are converted into an optimised reserve using either classical nested pits or cutting edge Direct Block Schedulers that produce a pre-optimised input to more detailed scheduling and financial analysis. Reserves are validated both before and after conversion into schedule-ready mining blocks. 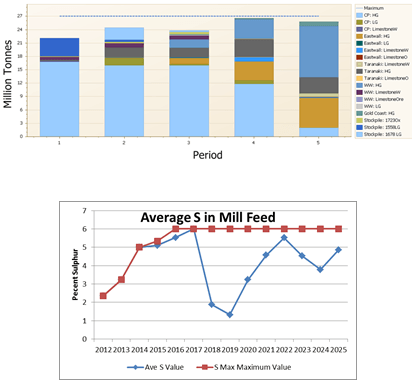 Reserves are evaluated before and after schedule optimisation in terms of issues such as blending and cut-off strategy. Once a base case production scenario is in place, options and sensitivity analysis is used to evaluate the impact of alternative strategic decisions and the sensitivity of project outcomes to changes in key inputs, such as price and recovery. 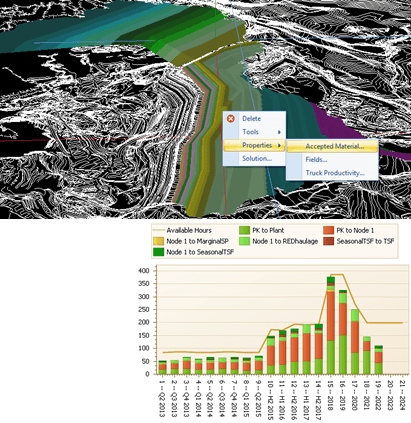 We also offer a comprehensive analysis of the sensitivity of the production schedule and project value subject to geologic uncertainty using conditional simulation. The optimisation technology used by MineSmith Australasia is ideal for project risk evaluation and mitigation as the solution found for each change in inputs is verifiably optimal. This ensures an apple to apple, orange to orange comparison across all options without the noise inherent in a non-optimal schedules. All projects are conducted by Dr. Martin Smith, Managing Director. His area of expertise is optimization applied to mine design, scheduling and business improvement. His experience encompasses reserve analysis, mining software design, mineral economics and education with over 50 publications on these topics. With over 30 years’ experience in the minerals industry as a mining engineer, consultant, and lecturer, he is a recognized consultant, educator and researcher with a focus on the development and application of optimization solutions for the minerals industry. He has applied these in a wide variety of mineral projects ranging from industrial minerals to underground selective and mass mining metalliferous operations. We do not fit your project into a Black Box commercial product. Each project is implemented as a customise model built from the level of the reserves up to the financial model. Model development is supported by utilities that rapidly convert standard planning inputs into a detailed production scenario. MineSmith Australasia services are built on industry leaders in mine optimisation, mathematical modelling, mine planning and design and optimisation. These products are substantial value to your project while reducing project duration and cost. MineSmith Australasia offers access to these products at a greatly reduced cost. Peer to peer puts the client in direct contact with the ultimate service provider without the add-on costs of management and the invisible costs of supporting staff, office space and marketing. As a client you will work directly with the principal consultant. Likewise, if you require supporting services, these can also be arranged for you on a peer to peer basis with collaborating independent consultants. Optimise strategic decisions arcoss multiple mines, processes and products such as the capacity and timing of production, mine specific variable cutoff policies, stockpiling strategies, process capacities and optimal product mixes. MineSmith Australasia as a company has been continually conducting mine optimisation projects since 2008. However, the underlying technology is based on research and consulting conducted by Martin Smith starting in the early 1990’s. Multiple projects conducted for sites located in: Australia, USA, Canada, Chile, Mexico, Laos, Indonesia, PNG, Saudi Arabia, South Africa and Zambia. Projects include both feasibility studies and operating mines with an emphasis on either project valuation or maintenance of production targets and Life of Mine plans. We specialise in difficult planning problems which defy solution using commercial mine planning packages. Clients include: Ma’aden Gold, Hot Chile, Rio Tinto Iron Ore, Glencore, PanAust, Ok Tedi, Barrick, Codelco, Oz Minerals, Consolidated Minerals, Beaconsfield Gold, Zinifex, BHPB, KPC, XSTRATA and DeBeers. Please see our ever expanding list of case studies in the Case Studies section. MineSmith Australasia has worked with various sectors of the minerals industry. Projects have included both underground and surface operations and in some cases projects that combine both underground and surface operations. Sectors of the mineral industry include base metals, precious metals, diamonds, industrial minerals and coal. Recent activity has been focussed on open cut Gold operations. “In science, computing, and engineering, a black box is a device, system or object be viewed in terms of its inputs and outputs, without any knowledge of its internal workings. Its implementation is "opaque" (black).” – Wikipedia. the engine is supplied as a compiled executable and could not be modified even when the underlying methodology is extendable to a larger class of problems. Our solutions are based on mathematical modelling. Projects are converted to a model consisting of clearly defined variable, constraints combining those variables and an objective function using one or more of these variables. These are then solved using a wide variety of available solvers, providing the client with a range of options ranging from open source to top shelf commercial solution engines. The inputs, outputs, optimisation model and engine are all accessible and can be customised to suite the client’s needs. Using a math model paradigm puts the emphasis on the model itself, not on the solution engine. This means that a wide variety of possible mine planning problems can be formulated and solved. This class of optimisation problem has the advantage of being solved to a mathematically verifiable optimal solution, not simply the best solution from amongst all solutions examined. A MineSmith Australasia Life of Mine (LoM) planning project encompasses reserve optimisation to financial outcomes. A number of options are available for reserve optimisation from standard Lerch-Grossman nested pits and push back selection to Direct Block Scheduling (DSO). DSO finds a set of annual pit shells that maximise or minimise a selected objective (of which NPV is one option) subject to constraints on pit slopes, mining and milling capacities. DSO can provide a far superior starting point for stage designs that balance mining and milling constraints. 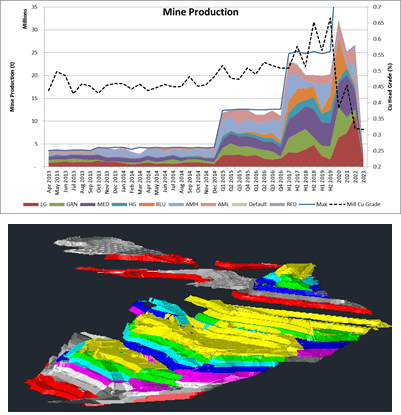 LOBOS, MineSmith Australasia’s in-house mine planning system, goes beyond a standard production scheduler. The mine design and reserve model are converted into schedulable mining blocks. A production schedule is then modelled around the optimal sequencing and scheduling of the materials in these blocks. The schedule of mining physicals (e.g. tonnage mined, metal recovered, benches depleted, length of decline driven) is then converted into products and financial outcomes (waste or tailings generated, hours consumed, costs and revenues). Any change in the scenario inputs is reflected in optimised financial outcomes. Math programming and modelling is nothing new. What is new is the power available to the user to solve increasingly large and difficult problems. Normally, the process of writing a mathematical model can be long and costly. The LOBOS platform rapidly converts standard mine planning inputs into a mathematical model, fully customised to project specifications. This makes full power of math programming available to the client at a fraction of the normal time and cost. 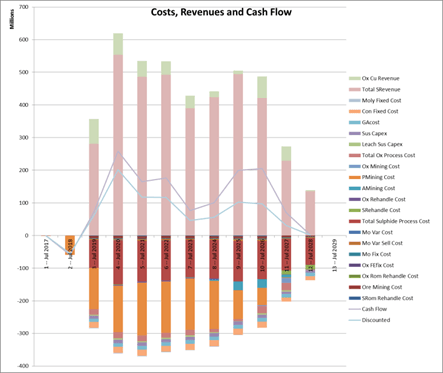 LOBOS is fully competitive with more limited mine planning software offerings, but results increased project value. 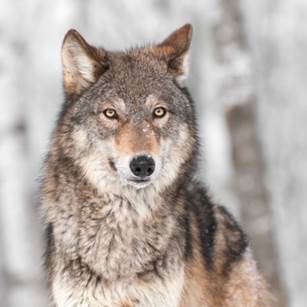 From its inception, the development LOBOS and other supporting MineSmith Australasia products was driven by client requirements. Our toolbox and methodology has continuously evolved based on decades of support to the mining industry. As a MineSmith Australasia client you benefit from decades of industry-sponsored and outcome driven product development. MineSmith Australasia offers a premium boutique consulting service at a substantially lower rate than the rates of a larger consulting firm. As a family owned and operated company, MineSmith Australasia is extremely lean. We have decades of experience in the field of mine planning and optimisation. As a result, production scenarios are implemented in minimal time and cost. We also offer software development at low internationally competitive rates. MineSmith Australasia software products are available to repeat clients with customisation services and ongoing software support. Micromine – a leader in mining software solutions spanning the entire mining process from geological exploration and 3D mine design to mine production management, mine production control and data management solutions. AMPL - supports the entire optimization modeling lifecycle — formulation, testing, deployment, and maintenance — in an integrated way promotes rapid development and reliable results. 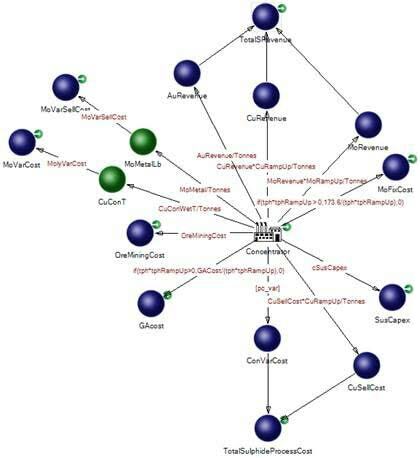 Gurobi - the state-of-the-art-solver for all major model types including LP, MILP, MIQP, and others, used in dozens of industries and by over 1200 companies. 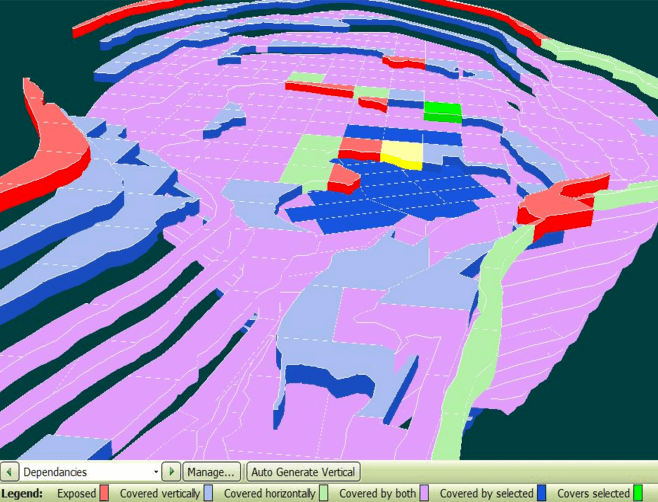 MineSmith Australasia’s services enable integration with client mine planning systems through Micromine. Our in-house planning systems integrate AMPL for advanced modelling with Gurobi for standard model generation and solution. A wide variety of other solvers are also available through the AMPL API incorporated into LOBOS. 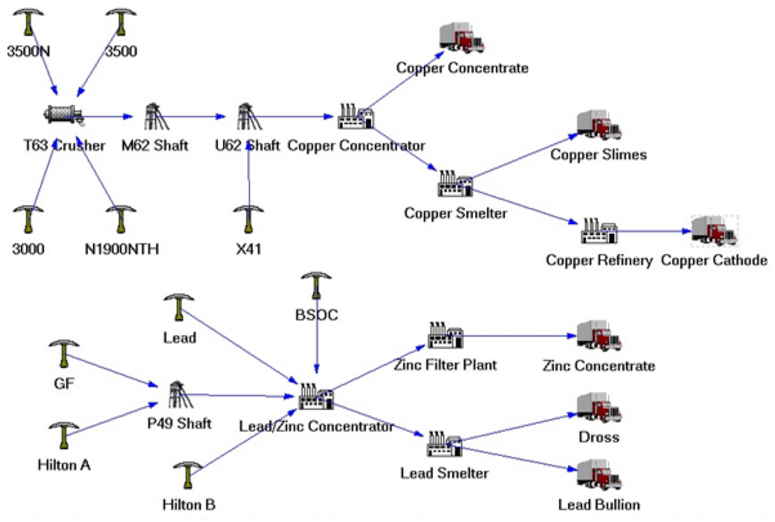 The inputs required for mine plan optimisation are no different from that required for any other mine planning exercise: the resource model, mine design and metallurgical and financial relationships. Where the optimisation approach to mine planning diverges is by placing an emphasis on achieving production targets and constraints. Designs are converted into schedulable volumes of a size and geometry that support the mining method and scheduling interval. Mine plans for underground or surface mines are optimised at the appropriate level of schedule granularity. 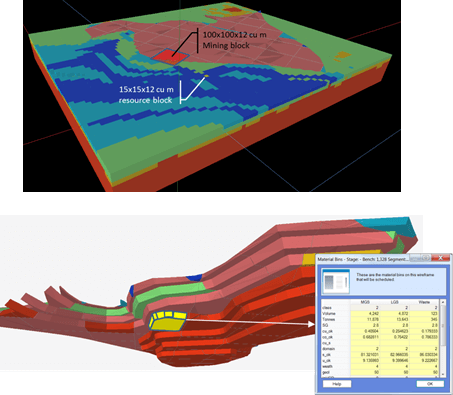 MineSmith Australasia’s modelling and optimisation methodology supports medium term blast-master scheduling of open cuts and development and production scheduling for underground mines. All projects are initiated comparing reported reserves using Micromine utilities with those of the schedulable reserves included in the production scenario. The mineral inventory is validated against expected production targets prior to modelling the production scenario. These reports with analysis are presented to clients as a first check on initial assumptions and targets. Within a schedulable volume the mining inventory is separated into material bins. 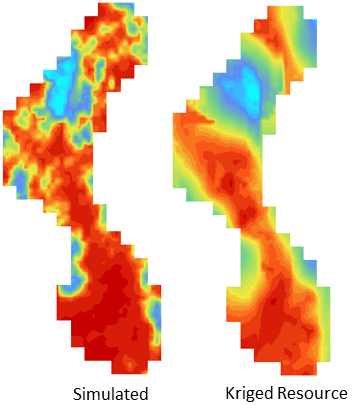 Material bin definitions are associated with optimisation targets such as grade ranges or net revenue intervals. Bins are further categorised into material parcels associated with categories such as the resource classification or lithology. The objective function is a reflection of the desired project outcomes, whether that is cash flow maximisation or resource recovery. Material bin definitions and the measure of cut-off follow the objective function such that the function used supports maximisation of project value. Sequencing constraints control access to the mineral inventory, defining which schedulable volumes must be depleted to gain access to additional reserves. Sequencing is not based on a presupposed mining geometry and can be quickly applied between benches and stages in an open cut or to a blast-master of drill and blast volumes on a bench. The optimisation process then determines the optimal mining sequence while maintaining the required access. Before a schedule can be produced we need to know the start date, number of intervals and their durations. LOBOS provides a Calendar Manager in which the number and durations of scheduling periods can be varied as needed for a given scenario. Alternative calendars make it possible to optimise a mine plan on an annual basis and then re-optimise the annualised schedule on a monthly basis. Calculated fields such as milling throughput rates and metallurgical recovery can be added to the mineral inventory at the level of the material parcels. These are then related to constraints on production such as the available milling hours, maximum cathode production and blending constraints. These constraints are often primary drivers in the mine plan. Mine planning cannot be isolated to a single mine. Even in single pit scenarios, the interaction of the pit with stockpiles, waste dump and tailing impoundment construction, the materials handling network and processing plant is crucial. For example, in copper projects separate processing plants with different start dates, ramp-ups, recoveries, capital and operating costs are required for oxides and sulphide, necessitating pre-stripping and sulphide stockpiling. 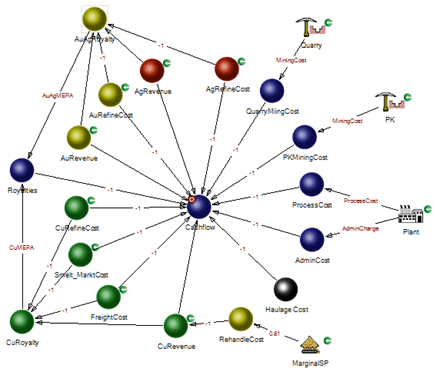 MineSmith Australasia production scenarios represent the interactions between mines, dumps, stockpiles, plants and haulage as a multi-product network flow. Optimisation is of the entire complex providing a complete Life of Complex planning solution. Haulage cost and material movement capacities are based on detailed cycle time calculations. These are input as cycle times per available destination from the bench or production face. Cycle times are also added to the arcs of the material handling network exterior to the mines and leading to intermediate and final destinations. Optimisation of the production scenario equates material movement from the bench to the optimal destination to haulage cost, accounting for the hours consumed and limiting total material movement to the hours available. Fleet numbers and capacity are varied to minimize production cost and level material movement. For many projects a dump is simply the destination for any material classified as waste. But for most operating mines or for projects in sensitive environmental setting, waste management is a major diver in mine planning. Waste storage and construction can be included in the production scenario. This can include sequencing stage depletion with in-pit dumps, tailings storage impoundment construction and alternative waste destinations according to various waste material bin classifications. Constraints commonly applied to processing plants, such as contaminant limits, blending and capacity, are also available on dumps. Production physicals are not restricted to tonnes of ore and waste, but can include downstream products such as tailings with tailing production related to planning of tailings storage and remediation. MineSmith Australasia converts your project into a mathematical model solvable to a provably optimal solution using a variety of Solver engines, ranging from open source algorithms to cutting-edge commercial optimisation products. Whenever possible, the production scenario is modelled as a Mixed Integer Linear Program (MILP). In recent years, MILP technology has passed the tipping point in which extremely large and demanding mine planning problems can be solved to optimality with modest computational resources. Other formulations such as Convex, Nonlinear and Constraint Programming are available using the AMPL modelling language API that is integrated in MineSmith Australasia’s LOBOS technology. The combination of the LOBOS mine optimisation platform with the AMPL API enables rapid generation of custom optimisation models. MineSmith Australasia is by no means limited to open cut metalliferous projects and has provided optimised mine plans for coal, iron ore, underground block caving, sublevel stoping, cut & fill and surface stripping operations. For most projects, production scenarios are optimised as MILP models using the Gurobi solver. However, a wide variety of alternative Solvers are available. These MILP models are characteristically large and often difficult to solve. 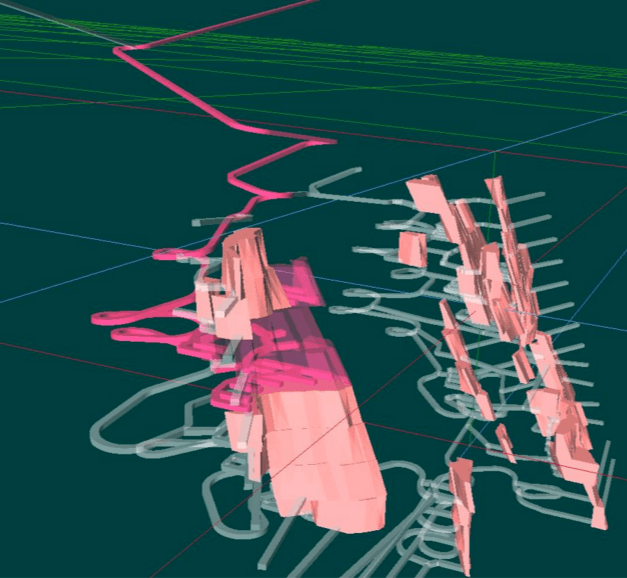 MineSmith Australasia combines decades of experience, with in-house algorithms, heuristic procedures and the LOBOS mine modelling platform with state-of-the-art commercial technology to optimise the most demanding production scenarios. We specialise in custom requirements and difficult problems. 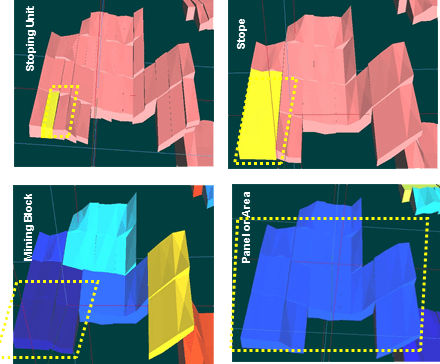 A MineSmith Australasia production scenario includes options for alternative material parcel destinations that, when solved, realise an optimal cut-off strategy. This strategy is based on variable cut-off that changes according to time, position and processing constraints. Following optimisation, the solution is analysed in terms of what was processed versus deferred to a stockpile or wasted. This analysis results in an appropriate measure of cut-off which is then incorporated into the material bin definitions and stockpiling strategy. Re-optimisation with the appropriate measure of cut-off results in an optimal cut-off policy. Each optimised solution is reported to Excel with details of the scenario inputs, solution log, scenario changes and schedules of production for all mines, stockpiles and plants included in the scenario. The LOBOS UI is a complete graphical representation of the scenario in which all graphical elements represent a variable in the model. The solution to these variables is available as tables and graphs in the LOBOS UI. The production schedule can be exported as a block model, ready for import to most standard mine planning packages. Possibly the most powerful aspect of MineSmith Australasia’s methodology is the opportunity to address many what-if scenarios and evaluate risk quickly, comprehensively and at low cost. The first phase of any new project is to (1) gain an understanding of the project and (2) convert the inputs into a production scenario. Once the base production scenario has been solved and the solution validated, additional changes typically require a fraction of the initial setup time. For example, we might want to evaluate project sensitivity to changes in metal price. All that is required is to simply change the price forecast, re-optimise, report and repeat. A successful mine optimisation project is all about organisation, concise clear communication and flexibility. Do not deluge the consultant with emails and documents. Keep all communications focussed on the specifics of the project and question the outcomes. Fully validate crucial inputs to avoid costly restarts late in the project. Use an ftp site with dedicated folders for the resource model, designs and Excel-expositions of financial and metallurgical calculations. Put aside all preconceptions based on your experiences using standard commercial mine planning packages; these are limited in comparison to MineSmith Australasia technology. Treat strategic optimisation as the starting point for any project, even in the case of an active operation. Do not wait until changes in strategic decisions are financially or politically frozen in stone. Technical and educational material in the field of mine planning with an emphasis on low cost tools common the operations research community but largely unknown in the mining industry. © 2018 MineSmith Australasia. All Rights Reserved.